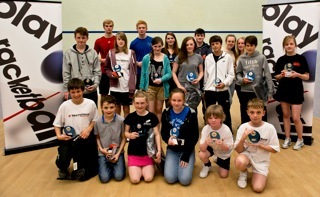 Over the weekend of Saturday 11th12th May, over 40 juniors from around the country took part in the “Tecnifibre National Junior Racketball Championships” at Hallamshire Tennis and Squash Club, in Sheffield. Now in its 4th year, the Championships ran a total 10 events for both Girls and Boys: Under 11, 13, 15, 17 and 19, which culminated in some inspiring finals on Sunday afternoon. John Mullins, Hallamshire’s Head Professional Squash and Racketball Coach, said this was a fantastic event filled with excellent matches and great support from friends and families of the competitors, for some of whom this Championships was their first ever tournament. At the finals trophy presentation, both Matilda Parslow and Hamish Falconer thanked the organisers for providing markers and referees which took the pressure off the competitors between matches. BU11 event (MONRAD) saw Hallamshire’s own Leon Moshin take the title in what was his first tournament. He played some fantastic matches and embraced the event as a true professional! GU11 (Round Robin) saw the delightful 8 year old Emma Wilkinson play her first tournament. The event was won by Hallamshire’s Georgie Wakely withHelena Boyle (Hallamshire) as close runner-up. BU13 (MONRAD), Joel Gardiner (U11 champion 2012) met No.1 seed Kieran Shelley (Brampton Manor) . A great final was played and Kieran claimed the title in a 3-0 victory (11-7/11-1/11-7), without dropping a game in the rounds leading up to the final. GU13 (round robin) saw Gabrielle Barton (Brampton Manor), playing racketball for the first time, win this event with Hallamshire’s Isobel Davies as runner-up. BU15 (round robin) was a close event with Stourbridge’s George Snowplaying his first National Championships claiming the title and Nick Wall (Abbeydale) as runner up. GU15(round robin) saw Laura Jones (Brampton Manor) and Gemma Gardiner (Hallamshire) play a lovely final which Laura won 3-0, Gemma putting up a brave fight against the more experienced Laura. BU17(MONRAD) saw two evenly matched players battle it out for the title! Matt Barton (Brampton Manor) and Alex Musselwhite (Hallamshire) played a great final, with Matt just holding on enough to win the title. GU17 (MONRAD) saw Grace Spink (Hallamshire) cause an upset as No 4 seed by defeating No 2 seed Hannah Mulvey (Bishops Stortford) in an earlier round. Grace was this year’s runner-up and Lucy Ward won the GU17 championships. GU19 (MONRAD) was an excellent event culminating in an epic final betweenMatilda Parslow (Leeds) and Lucy Ward (Hallamshire). Some top class and inspirational racketball was played with both players dominating the long rallies and playing to their limits. Matilda managed just hold on to her 2012 title, with a 3-1-win (11-6 /8-11/11-8/13-11).